In the search for planets similar to our own, an important point of comparison is the planet’s density. A low density tells scientists a planet is more likely to be gaseous like Jupiter, and a high density is associated with rocky planets like Earth. But a new study suggests some are less dense than previously thought because of a second, hidden star in their systems. As telescopes stare at particular patches of sky, they can’t always differentiate between one star and two. A system of two closely orbiting stars may appear in images as a single point of light, even from sophisticated observatories such as NASA’s Kepler space telescope. This can have significant consequences for determining the sizes of planets that orbit just one of these stars, says a forthcoming study in the Astronomical Journal by Elise Furlan of Caltech/IPAC-NExScI in Pasadena, California, and Steve Howell at NASA’s Ames Research Center in California’s Silicon Valley. Some of the most well-studied planets outside our solar system — or exoplanets — are known to orbit lone stars. We know Kepler-186f, an Earth-size planet in the habitable zone of its star, orbits a star that has no companion (the habitable zone is the distance at which a rocky planet could support liquid water on its surface). TRAPPIST-1, the ultra-cool dwarf star that is home to seven Earth-size planets, does not have a companion either. That means there is no second star complicating the estimation of the planets’ diameters, and therefore their densities. Previous studies determined that roughly half of all the sun-like stars in our sun’s neighborhood have a companion within 10,000 astronomical units (an astronomical unit is equal to the average distance between the sun and Earth, 93 million miles or 150 million kilometers). Based on this, about 15 percent of stars in the Kepler field could have a bright, close companion — meaning planets around these stars may be less dense than previously thought. When a telescope spots a planet crossing in front of its star — an event called a “transit” — astronomers measure the resulting apparent decrease in the star’s brightness. The amount of light blocked during a transit depends on the size of the planet — the bigger the planet, the more light it blocks, and the greater the dimming that is observed. Scientists use this information to determine the radius — half the diameter — of the planet. If there are two stars in the system, the telescope measures the combined light of both stars. But a planet orbiting one of these stars will cause just one of them to dim. So, if you don’t know that there is a second star, you will underestimate the size of the planet. For example, if a telescope observes that a star dims by 5 percent, scientists would determine the transiting planet’s size relative to that one star. 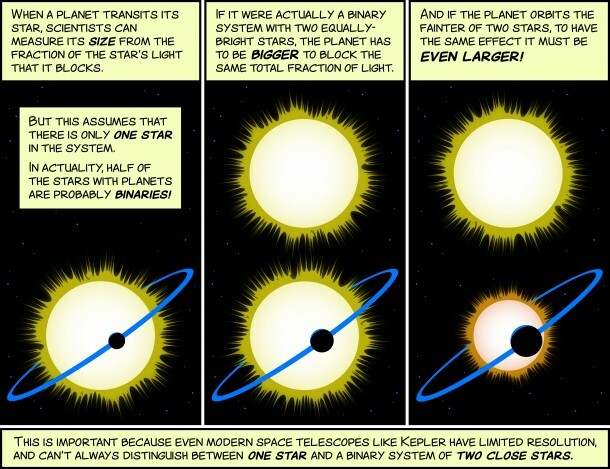 But if a second star adds its light, the planet must be larger to cause the same amount of dimming. If the planet orbits the brighter star in a binary pair, most of the light in the system comes from that star anyway, so the second star won’t have a big effect on the planet’s calculated size. But if the planet orbits the fainter star, the larger, primary star contributes more light to the system, and the correction to the calculated planet radius can be large — it could double, triple or increase even more. This will affect how the planet’s orbital distance is calculated, which could impact whether the planet is found to be in the habitable zone. If the stars are roughly equal in brightness, the “new” radius of the planet is about 40 percent larger than if the light were assumed to come from a single star. Because density is calculated using the cube of the radius, this would mean a nearly three-fold decrease in density. The impact of this correction is most significant for smaller planets because it means a planet that had once been considered rocky could, in fact, be gaseous. In the new study, Furlan and Howell focused on 50 planets in the Kepler observatory’s field of view whose masses and radii were previously estimated. These planets all orbit stars that have stellar companions within about 1,700 astronomical units. For 43 of the 50 planets, previous reports of their sizes did not take into account the contribution of light from a second star. That means a revision to their reported sizes is necessary. In most cases, the change to the planets’ reported sizes would be small. Previous research showed that 24 of the 50 planets orbit the bigger, brighter star in a binary pair. Moreover, Furlan and Howell determined that 11 of these planets would be too large to be planets if they orbited the fainter companion star. So, for 35 of the 50 planets, the published sizes will not change substantially. This effect of companion stars is important for scientists characterizing planets discovered by Kepler, which has found thousands of exoplanets. It will also be significant for NASA’s upcoming Transiting Exoplanet Survey Satellite (TESS) mission, which will look for small planets around nearby, bright stars and small, cool stars.